The Resort 2012 collections have presented us with many great ideas this week and have given a few hints of things to come for next Spring. Celine wowed us yet again with modern silhouettes this time adding floral prints and pops of neon pink while Alexander Wang showed us his sportier side perfecting some of his better separates from previous seasons. There have been many notable collections thus far, but I always anticipate Proenza Schouler’s collection each season the most. The duo has proven to us season after season that they are a force to be reckoned with as they have perfected the art of making a home-spun/ethnic/Arts and Crafts aesthetic the coolest thing coming out of NYC since Marc Jacobs in the late 90′s. The CFDA just agreed, awarding them last year’s recipient of Womenswear Designers of the Year. This time around, I had extra incentive as I have been working with the accessory designers, Alex & Lee, that collaborated on the necklaces for Proenza’s Resort 2012 collection. Jack and Lazaro were in a San Francisco state of mind when designing this collection and were inspired by a feeling that came from the late 60′s in the bay area. While doing research, they stumbled upon vintage pieces by Alex & Lee who were one of the most influential accessory brands of that time. Known for their timeless artisanal design, Alex & Lee developed their voice by designing one of a kind pieces of Art-to-Wear jewelry that incorporate intricate knotting of macramé with natural elements and found objects. As lovers of Folk Art coupled with Alex & Lee’s storied position in Fashion history as both CFDA and Coty Award winners, Proenza did not hesitate to ask the famed artisans to collaborate on this collection. The collection, limited to four 4 exclusive styles, incorporates natural and industrial elements. From hand-carved wood to copper, pyrite, resin and more, the collection evokes a modern perspective with a rich historical feel. It was a natural fit for both sets of artists as Proenza is known for their artisanal touches and their love of assemblage in design. Sure to become the most coveted accessories of the season, the necklaces are a perfect representation of the mystical and textured feeling that came from the early 1970′s. 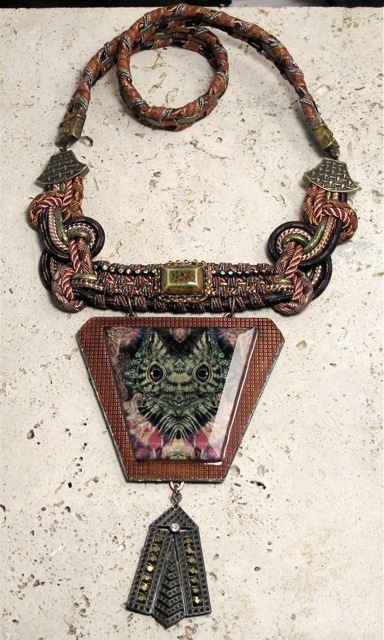 “Iguana Pup” includes a photo collage of iguana, orchids, cactus, and sea urchin under beveled glass with resin on a circuit board. The drop is patinaed brass cast of a vintage pin with bronze fumed rhinestones. 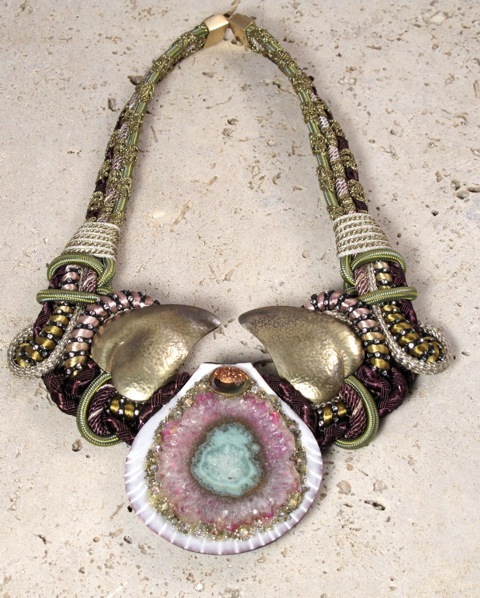 The piece is hand dyed cord & trim, knotted and woven with bronze findings. 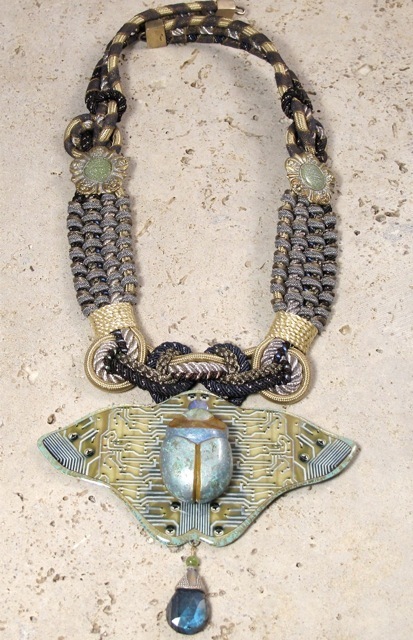 “Circuitry Scarab” includes a photo collage of a circuit board on Hand hammered and toned brass, with a hand painted carved casting of a scarab and opal in a resin pour. The drop is Labradorite and Peridot with toned Sterling. The piece is hand dyed knotted and woven cord with a bornze clasp. “Crystal Candy” includes a Brazilian Stalactite Slice, toned and backed with reflective film, on a shell, embellished with a fumed Drusy and surrounded by pyrite and rhinestones. It has hand hammered brass elements, hand dyed and wrapped Cord and trim with rhinestone chain and a Bronze Clasp. 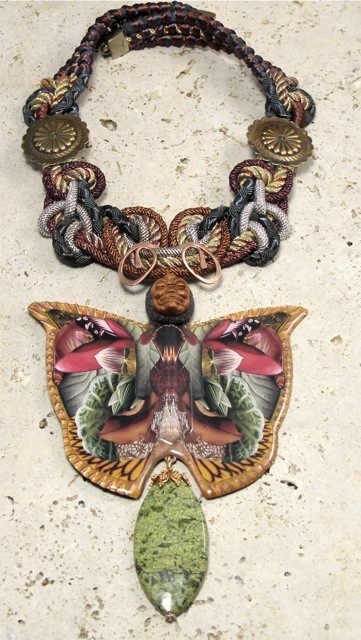 “Tropical Moth” includes a photocollage of flowers, foliage and a butterfly wing on hammered raised hand toned copper, under a resin pour and chandelier crystal, Carved wood ojime’ head with copper antenae, Serpentine and Vermeil Drop, Hand dyed knotted and woven cord & trim, brass and bronze elements and findings. In the meantime, I am also in a “San Francisco state of mind” and will be heading up there this weekend to start on a new project for the next couple of months. I look forward to getting back into the creative scene there and I can’t wait to share with you the inspiration that I find! View the rest of Proenza’s amazing Resort collection below. Oh wow!!! these are ammazing! LOVE the way they have integrated recycled computer parts- I really thing that finding a way to eco chic recycled electronics is the next big move. Keep the goodness coming! What I love most about Proenza Schouler is that their collections are constantly evolving and the Alex & Lee jewelry is a perfect match. It’s nice to see a collaboration between two incredibly unique designers. Margaret!! These are absolutely stunningly beautiful! Hi, constantly i used to check web site posts here early in the daylight, since i enjoy to find out more and more. Hi there to every body, it’s my first go to see of this blog; this web site includes awesome and genuinely good stuff in support of readers.